Indiana University East and Purdue University College of Technology in Richmond students now have their work on display in the Meijer Artway through Friday, May 10. Students exhibiting work were in fine arts classes at IU East during the fall 2012 and spring 2013 semesters. Instructors selected pieces for monetary awards during the artists’ reception April 17. Robert Warfel, president of Stagg Safety of Richmond, sponsored the awards. Visitors are welcome to view the exhibit during regular hours, 8 a.m. to 5 p.m., Monday through Friday. For more information, call Ed Thornburg, gallery curator, at (765) 973-8605 or visit iue.edu/gallery. Thirty-one IU East Honors Program students presented papers at the Mid-East Honors Association (MEHA) Conference in Dearborn, Mich., held April 5-7. MEHA is comprised of honors colleges and programs from Eastern Illinois, Indiana, Northern Kentucky, Southern Michigan, Ohio and West Virginia. Students were accompanied by Alisa Clapp-Itnyre, Honors Program director and professor of English, Daron Olson, assistant professor of history, and Ron Itnyre, visiting lecturer in biology. Leigh Anne Ernst, Richmond, Ind. Rachael Money, Cedar Grove, Ind. Six IU East students presented their research or creative work at the 25th Annual Indiana University Women’s and Gender Studies Undergraduate Conference, which was held at IU Bloomington on April 12. IU East faculty members Denise Bullock, associate professor of sociology, Ann Kim, assistant professor of fine arts, and Laverne Nishihara, associate professor of English, served as faculty advisors and chaired sessions at the conference. 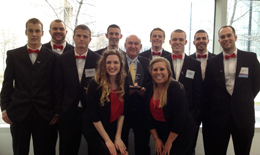 The Enactus team at Indiana University East has received two more awards since attending the Enactus United States Regional Competition Exposition held April 12 in Chicago. The team was named a league champion in its league while in Chicago and will advance to the national competition May 21-23 in Kansas City. The Enactus team received notification that it has also received a 4.0 Club Award and Club 44 Award. The 4.0 Club Award recognizes chapters for quality education programs, success in Enactus and long-term sustainability in enabling progress through entrepreneurial action. Enactus United States has a Team Index that was designed many years ago to measure the health of a team. The factors used to evaluate a team on the Team Index includes: Quality Faculty Advisor, Quality Administrative Support, Student Leaders’ Success, Program Success, Financial Stability, Community Engagement, Participating in Enactus Events and Competitive Initiatives, and Competition Results. Each year Enactus recognizes the teams who earn a 4.0 or higher out of a 5.0 scale. The Club 44 Award recognizes the accomplishments of the top university teams in the nation. Enactus U.S. has set a benchmark for college and university teams to reach 44 students per team; IU East has a total of 46 students participating in Enactus. To honor those teams reaching 44 or more active members, Enactus U.S. recognizes each team, awarding them for their membership into the Club 44. Active Enactus team members contribute at least 10 hours an academic year by using their business concepts to develop community outreach projects that improve the quality of life and standard of living for people in need. IU East students on the team are Hannah Clawson, Hagerstown, Ind., Ryan Doughty, Richmond, Ind., Tyler Fangman, Cold Spring, Ky., Drew Houck, Portland, Ind., Nick Miller, Lynn, Ind., Dan Printz, Greenville, Ohio, Bryan Schlatter, Indianapolis, Clint Shepherd, Eaton, Ohio, Troy Weir, Richmond, Ind., and Megan Winn, Eaton, Ohio. Enactus (formerly known as SIFE) is a community of student, academic and business leaders committed to using the power of entrepreneurial action to enable human progress. Enactus establishes student programs on college campuses across the nation. Enactus students apply business concepts to develop community outreach projects, transform lives and shape a better, more sustainable world.